1 Way will make sure we have you ready for your driving test day. So the day has arrived that both yourself and your driving instructor have been working towards. Naturally you might feel a little nervous, but be rest assured that we will only allow our students to take their driving test when they have covered the whole syllabus of learning to drive. You will have already demonstrated to your instructor that you have the skills & knowledge to do everything competently, so try and look forward to the big day. Your instructor will usually pick you up approximately 1 hour before your test start time. This will give you the opportunity to have a little warm up drive, and also allow plenty of time to get to the Driving Test Centre. On arrival at the test centre you will need to have your Provisional Photo Licence with you, and you will wait in the waiting room until the examiner comes out and calls your name out. 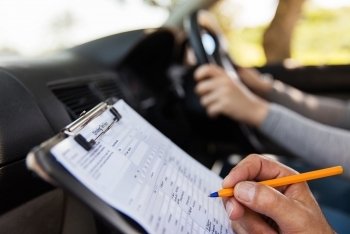 The examiner will check your licence, and ask you to sign the insurance and residency declaration at the top of the Driving Test Report Form. You will then be asked if you would like your instructor to accompany you on the test. If you prefer to go on the test without your instructor, they will be invited to listen in at the end of the test to the result and debrief if you would like them to. Before entering the car your eyesight will be checked, and you will need to read a car number plate from a distance of 20.5 metres. At the start of the driving test you will be asked one of the Tell Me questions which you can find on our site. You will also be asked one of the Show Me questions during the drive. The examiner will now explain a little about the test and ask you to start up, and drive off when you are ready. - You will be asked to follow directions from a Sat Nav or follow signs for about 20 minutes. - You may be asked to carry out the Controlled Stop exercise, although this isn´t done on every test. - You will be asked to park in a car park bay by driving in and reversing out, or reversing in and driving out or you may be asked to reverse park alongside another car at the side of the road. - You will also be asked to pull up on the left and right hand side of the road during your test. The test will last approximately 40 minutes, and at the end you will be given the result and some feedback from the examiner. In order to pass, you must not accumulate more than 15 Driving Faults or have any Serious or Dangerous faults recorded. If you pass you are now entitled to drive without supervision, however we would recommend a little further training on the Motorway or maybe do our Pass Plus Course to further develop your skills and confidence. This is optional but highly recommended. More information can be found on this site.